The Institute will provide time and space to design classroom materials. It is also a wonderful opportunity to connect with colleagues from across the campus. Dr. Jennifer Frederick, Executive Director of the Center for Teaching and Learning, and Dr. Nancy Niemi, Director of Faculty Teaching Initiatives, will lead the 2019 Summer Institute on Course (Re)Design with facilitators from the Yale community. The Institute will take place from Tuesday, May 21 through Thursday, May 23. View the 2018 schedule for an idea of the time committment - the 2019 schedule will be announced in Early-April 2019. The application for the 2019 SI is now open and will close on Tuesday, April 30, 2019. If you have any questions, please email Jennifer Frederick or Nancy Niemi. Please note: The institute is designed for, and funded by a source designated for, Yale faculty. We cannot accept applicants from other campuses. We encourage faculty or visiting faculty to explore the Summer Institutes on Scientific Teaching. The Institute will take place in Sterling Memorial Library and the Poorvu Center for Teaching and Learning (inside SML). The building is located at 301 York Street. The SML Lecture Hall is located near the Manuscripts and Archives department of SML, just beyond the Selin Courtyard. If you enter via the Poorvu Center entrance at 301 York Street, proceed down the main corridor toward the library and turn left. Follow that hall to its end. The Lecture Hall and Memorabilia Room will be on your left. We will have signs to help direct you. If you enter via the SML Nave on High Street, walk toward the circulation desk and turn right. Pass under the arch and proceed to the end of the hall. The Lecture Hall and Memorabilia Room will be on your left. 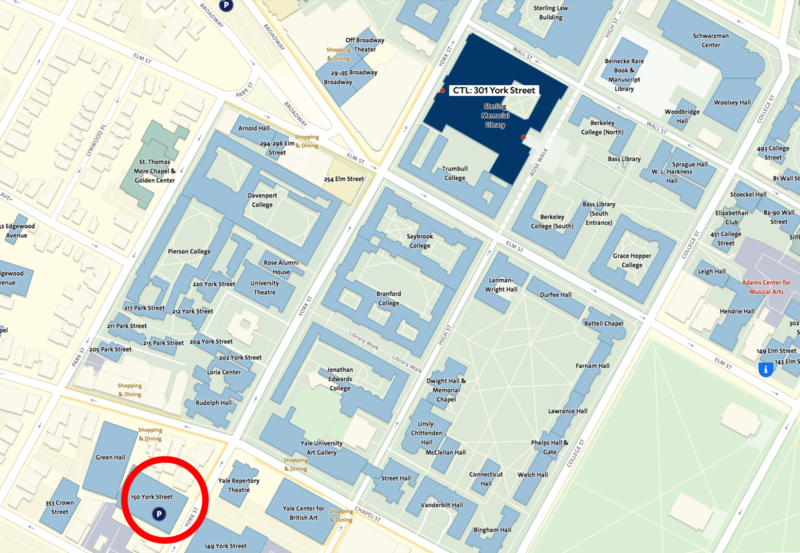 The nearest Yale parking garage/lot is located at 150 York Street, the Chapel-York garage. The daily rate until 6 p.m. is $10. See the map below to view the location of the garage in relation to the location of the Poorvu Center.